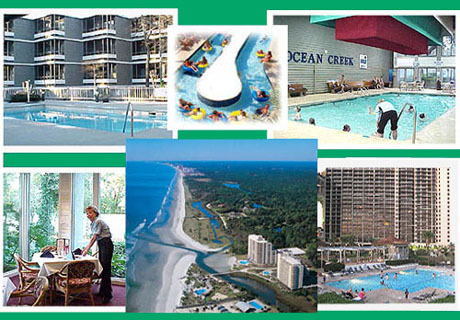 The picturesque, 57-acre Ocean Creek Resort is an upscale, plantation-style resort destination located directly across from Myrtle Beach’s famed Barefoot Landing in North Myrtle Beach, but outside the city limits. (thus the Myrtle Beach address.) A 24-hour gated entrance leads into this stunning North Myrtle Beach resort, which features different living accommodations to suit every need, desire and budget. 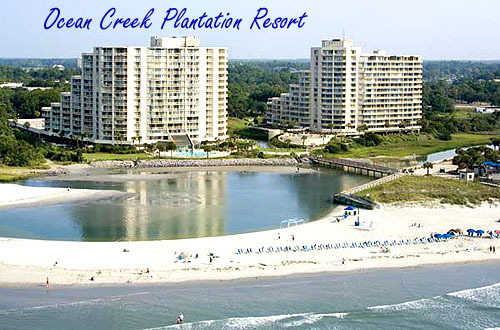 Read more about Ocean Creek Plantation real estate. The Garden Homes – The garden homes are attached, private homes which enjoy a quiet, wooded setting. Each home features a private, rear patio, a picturesque entry courtyard, vaulted ceilings in the main living areas, a fully equipped kitchen and a washer and dryer. The Garden Homes boast two and three-bedroom floor plans. The Oceanfront Towers – The two, oceanfront towers of Ocean Creek Resort are both 15 stories high. They overlook the Beach Club and enjoy beautiful views of the surrounding salt water creek. 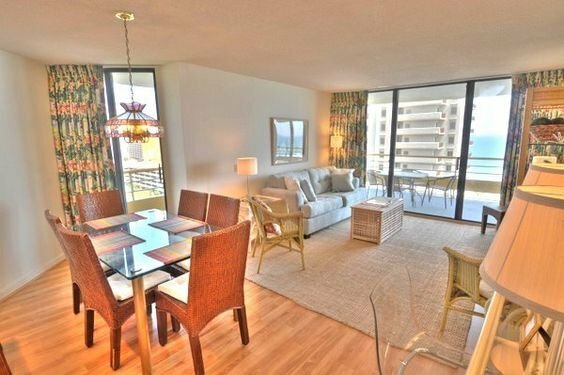 The Oceanfront Towers feature two and three-bedroom condominiums which boast a variety of nicely appointed floor plans. All homes in the Oceanfront Towers include tiled foyers, European-style cabinetry, wet bars, top-of-the-line appliances and private, expansive balconies which offer stunning views of the Atlantic Ocean. The Lodge Villas – The Lodge Villas feature one and two-bedroom luxury condominiums which are beautifully furnished and appointed. 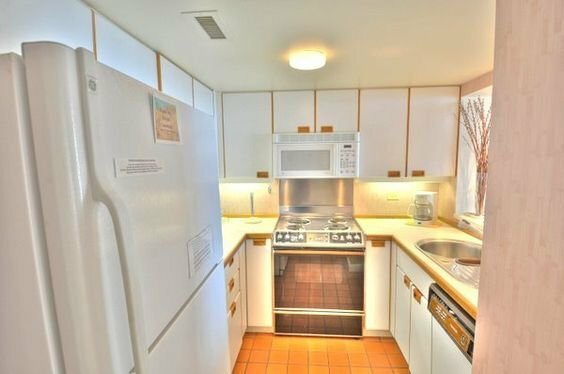 Each villa also includes a fully equipped kitchen. The Greens – The Greens feature two and three-bedroom, split-level townhomes which feature spacious living areas. The front lawn of The Greens is an actual putting green and the backyard features a landscaped pool area, complete with a lounging deck. The Tennis Villas – The Tennis Villas feature one, two and three-bedroom villas which are connected to the resort’s tennis center and pool. Some of the features of the homes of Tennis Villas include a private entry, a screened porch, a fully equipped kitchen and a washer and dryer. Upscale, on-site dining is provided by the Four Seasons Restaurant, which offers a fine array of dishes with a touch of Myrtle Beach tradition. An oceanfront summer beach club bar and grill serves tropical drinks and light fare, such as burgers, chicken and hot dogs.